New York, Feb. 2013 -- Although spring is definitely not in the air, it’s time to embrace the elements and get your cycling gear in shape for the most exciting pink events of the year! The Gran Fondo Giro d’Italia is kicking off in a few weeks! The series will start on Saturday, April 20 as part of the most beloved cycling festival in the nation: The Gran Fondo Giro d’Italia Sea Otter Classic will premier in Monterey, CA, adding its unmistakable Italian twist to this four-day outdoor sport and tradeshow event, which attracts a total of 10,000 riders from multiple disciplines and about 50,000 fans. The Gran Fondo Giro d’Italia will start from the world-famous Laguna Seca Race Track and will offer two different routes, Carmel Valley (96 miles) and Coastal (49 miles), open to riders of all capabilities willing to experience a real “Italian style” Gran Fondo in one of the greatest cycling areas in the US. Not to be missed, is the Expo, boosting a wealth of over 400 companies and featuring for the first time a dedicated Italian corner! Look out for the original Trophy and get your picture with the Milan Duomo! Impress your friends with your own personalized number and the limited edition jersey by Santini! Soon after, on May 5, the east coast will have its own Italian flair at America’s largest cycling event, the TD Five Boro Bike Tour. The new Gran Fondo Giro d’Italia Five Boro (VIP option) puts participants in front of more than 30,000 cyclists riding on 40 miles of traffic-free streets throughout the five boroughs of New York City! In addition, riders will receive an exclusive goodie bag and a personalized bib, a fashionable official Gran Fondo Giro d’Italia Five Boro jersey produced by Santini, a special breakfast before the start, and a gourmet Italian Pasta Party, awaiting the riders at the finish festival. Granfondisti will also try their best with the timed climb of the Verrazano Narrows Bridge. In addition to those iconic experiences, Gran Fondo Giro d’Italia will open registration on March 1 for its signature events in Pasadena, CA (June 2) and Miami, FL (November 10). Works are well underway for an additional event in California. The 2012 edition saw memorable courses, pictures with the signorine and the original Giro’s trophy, and Giro’s legends of past and present. The Gran Fondo Giro d’Italia brings to America a top international appeal and the ultimate expertise in mass-participation productions of a true “Italian” Gran Fondo experience, with breathtaking scenic courses, timed climbs and challenges that impart an atmosphere typically reserved for professional races, all in a fun “Italian style” environment that brings out the best of this sport. Gran Fondo Giro d'Italia is a worldwide series organized by RCS Sport, owner of high-quality sporting events including the Giro d’Italia, Milano – Sanremo, Tour of Lombardy, Tirreno – Adriatico, Strade Bianche (White Roads); the Milano City Marathon; Italian Open; advisor to the national Soccer Team, and to the Inter Football Club; advisor of the Basketball Italian federation and organizer of major events of the Lega Basket “Serie A”; in collaboration with the SDA Bocconi School of Management, RCS is also organizer of the Sport Business Academy. The Gran Fondo Giro d'Italia aims to connect cycling fans to the mystique of the Giro, hence growing the appreciation of Giro d'Italia in the world. 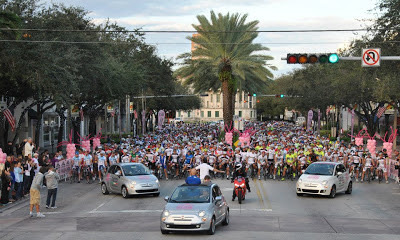 Photo: start of 2012 Giro d'Italia-Miami gran fondo. This is the last week to enroll in the lottery draw for L'Eroica which will be held on October 6th in Gaiole in Chianti. After March 3rd a notary will supervise the draw for the 2500 spots available to under 60 (note: there is no limit to the number of participants over 60 and women who can register up to the end of June). Register at www.eroica.it. 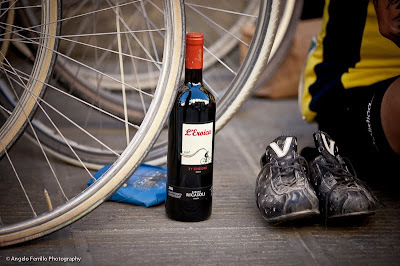 Another, new possibility, is that 50 spots for L'Eroica are reserved for participants in the Chianti Classic to be held in Castelnuovo Berardenga on Sunday, June 2nd. There are many more L'Eroica stories in ICJ; use the custom search in the upper right column to discover them. Perhaps less noticed in the photographs available of the Campagnolo 80th gruppo is the one of a fully complete bicycle, a photo in which the name of the frame doesn't leap out at you. The frame was made by Darren Crisp of CRISP Titanium. I first met Darren in 2007 (had I been smart I would have bought a frame from him then). Darren is an American that lives in work Castiglion Fiorentino (AR). In Darren's words, "Why Italy? I studied architecture back in 1990 here in Castiglion Fiorentino. It is a wonderful place to live and is very conducive to creativity, and the culture is very stimulating, coming from conservative Texas. The first time I came here, I knew immediately that there was something here to “discover” about this ancient and mysterious place. Medieval walled towns, Etruscan ruins…and great food and obviously great cycling. I came back after finishing my degree in architecture to race bikes here in Tuscany. Coming from the Texas plains, the hills of this region were a welcome change and offered me new places to explore on both the road bike and the mtb. Using my architecture degree to the max, I washed dishes in the local school for almost two years to afford me the possibility to learn the language and to race throughout the country. I had an accident on the mtb in 1994 and had to move back stateside for insurance and medical reasons and got back into metal fabrication in Mississippi. But the fire was lit, and it was only a matter of time before I was back over to Italy and back on the bike, in the shop, and building." Read the rest of his story here on ICJ. "I was contacted about a month ago, out of the blue, by Campagnolo. Their VP of Marketing who was a former Marketing guru for Pinarello reached out to me with an email. I was in disbelief when it arrived. The had tried to contact me via telephone unsuccessfully. When I work, the phone gets switched to voice mail so I can work uninterrupted. An email arrived shortly thereafter describing a “very important” project that Campagnolo was working on. They were very interested in discussing the project with me and I was asked to give them a call back. I was thinking to myself, “what could they be interested in a little guy like me for? Titanium components? A display frame for a trade show?” Well, I got on the horn and the project was revealed in detail. I was asked if I had a bike/frame that I could send them for the 80th Anniversary campaign. I was fortunate enough to have a bike in the shop that I had dedicated to display for my walk-in clients. It is the Bristol Road Bike, aka Trebbiano Silk Ti (you can see it here). I usually don’t have frames or bikes lying around as they get snapped up as soon as they are finished. After 10 years of not having a display bike, I figured it was time to keep on in the house. Boy was I glad I made that decision :-). I broke down the frame and the next day it was sent out to Campy with some parts that I had on hand: Unpainted Enve fork, Enve bars and seatpost and some other bits. The rest is Campagnolo goodness. A few weeks later I started getting compliments from distributors from around the world, USA, Malasia, Hong Kong, The Netherlands… I didn’t realize that the distributors had received advance private pdf’s of the new Gruppo, but it was obvious that something was circulating. Campy was nice enough to send me the hi-res photos and a video is in post-production right now of the build and photo shoot. 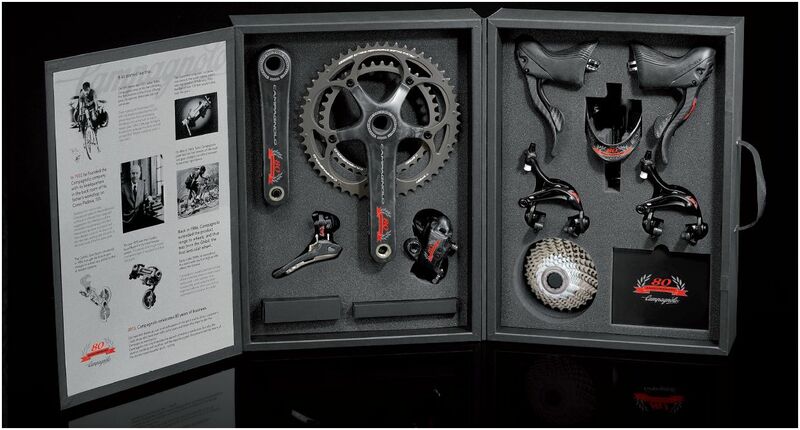 As soon as that is passed along to me, I will post it and you can have a look at the whole process from inside the gates of Campagnolo. They are very excited about it and I can’t wait to see that, too. I hope that gives you some insight into the process. It was a real exciting moment for me and I am humbled and grateful that Campagnolo took the time to consider a small artisan like myself. 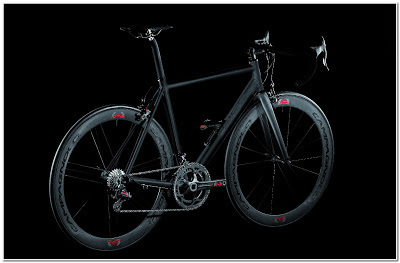 Pure emotional bliss for a framebuilder." I will have some more photos coming soon and the video. 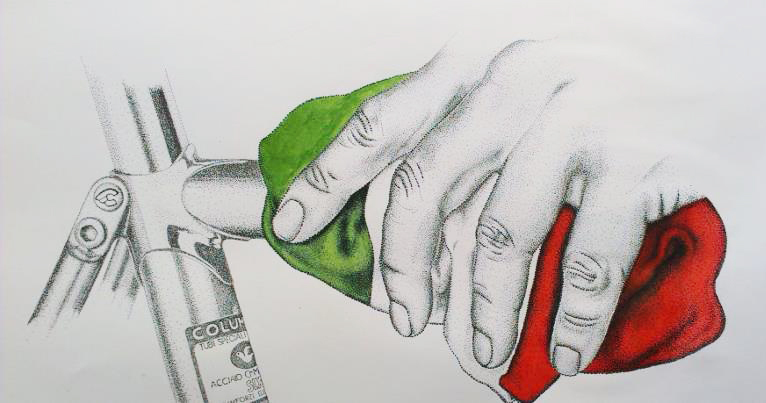 Thanks for keeping up with my work and continued success with The Italian Cycling Journal!!" The Michele Scarponi and Team Lampre-Merida relationship will end on December 31, 2013. The agreement was reached after negotiations with attorneys representing both parties. 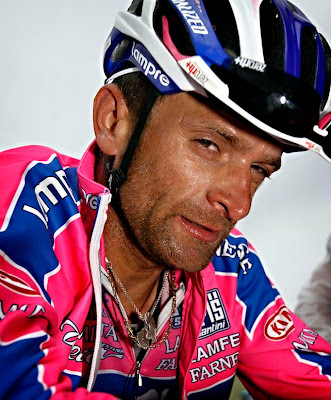 As we have noted, Michele Scarponi has been missing from any of the Team Lampre-Merida races this season or the team publicity events. After a series of meetings it was agreed that Scarponi will return to competition tomorrow at the Grand Prix of Lugano. His participation in future races this season will be decided by the "ethical and competitive interests" of Team Lampre-Merida and of the suitability of the races to Scarponi. 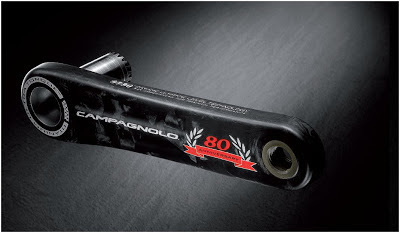 Campagnolo has launched www.anniversary.campagnolo.com dedicated to the 80th anniversary gruppo. Now it only shows a countdown timer with some 8 days to go. Anniversary units are expected to begin shipping in March; pricing has yet to be announced (you know it will be expensive). Not to be overlooked: two 80th anniversary wheelsets. 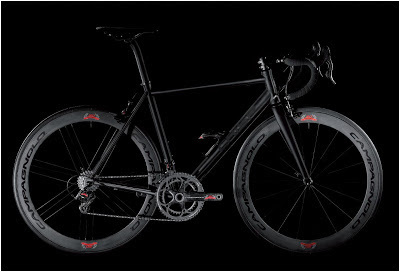 A 1,310g carbon wheelset and a 1,590g carbon/aluminum wheelset. 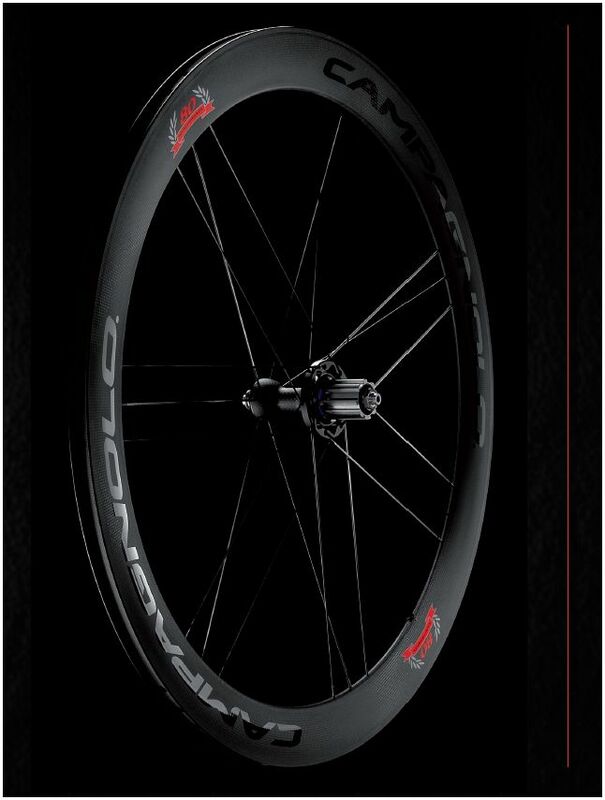 Both featuring 50mm tall aero rims with G3 spoke pattern. The Pegoretti art bike auction for helping children suffering from cancer began today. There are three frames being auctioned, the auctions will end on March 3rd. The auctions are on German ebay. If you have any questions you can contact the seller in English by clicking on mano-nella-mano on the upper right and then on "Mit Mitglied Kontakt". The ebay auctions are here (also on USA ebay here). For more information read this previous story in ICJ, more links from that story as well. Bid on these one-of-a-kind red fizik saddles for the benefit of World Bicycle Relief. 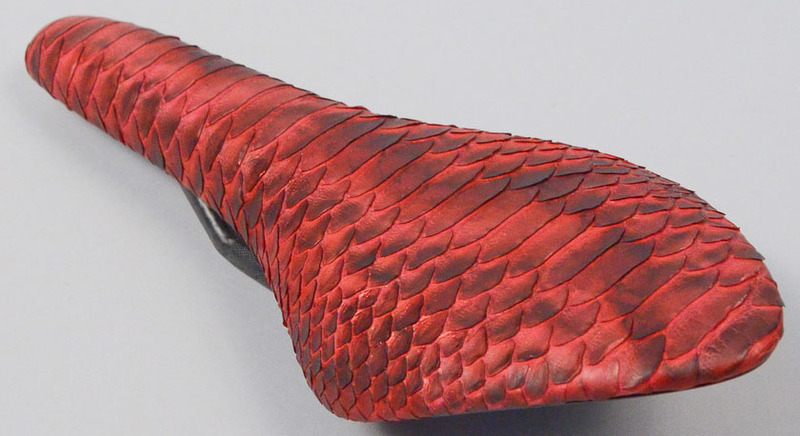 From fi'zk:k, "We have produced 15 one of a kind saddles, in 15 distinct shades of red, for this special occasion. In an effort to help promote cycling and transportation around the world we have chosen World Bicycle Relief as a beneficiary partner. Being an organization founded on the principals of compassion and integrity, we feel World Bicycle Relief is the perfect partner. Red is the color of passion, action and energy. Signifying qualities of leadership and promoting ambition and determination, red is a color fizik can call its own. Exuding a strong and powerful energy, red can even awake ones physical sense. Being a company defined by passion, energy and the beauty of design there is no better color than red to help define fizik. Fizik will be auctioning off 10 of these 15 one of a kind saddles and all proceeds will go to the World Bicycle Relief." 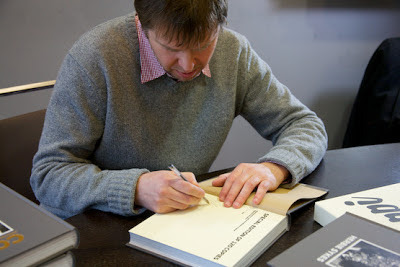 The auction last night and will be open to bidding for 10 days unil March 3rd. Please visit the Pros Closet (here on ebay) for saddle information, images and most importantly bidding. 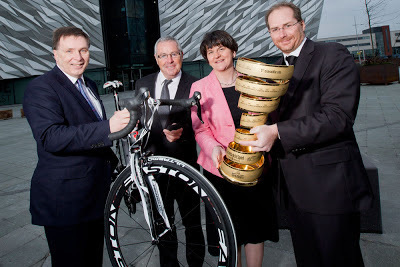 Alan Clarke (CEO of Northern Ireland Tourist Board), Stephen Roche, Minister Arlene Foster and Michele Acquarone. As anticipated, the announcement was made today that the 2014 Giro d'Italia will start in Belfast next year. From May, 10 to May 13, 2014, Northern Ireland and Ireland will host three days of racing around the cities of Belfast, Dublin and Armagh. Exact details of the stages will be confirmed at a later date. Michele Acquarone, the Director General of RCS Sport, said: "We are delighted to be taking the Grande Partenza of the 2014 Giro d’Italia to Ireland. This is an ambitious project for us for many reasons. Using sport, in particular cycling, to unite the island, is an idea we find deeply attractive. We recognise that, to do so, logistical perfection will be required on all sides. It will be the first foreign start for any Grand Tour since the implementation of a new UCI regulation prohibiting rest days on three-week Tours until the completion of at least seven days of racing." Northern Ireland's tourism minister Arlene Foster said, "The Giro d’Italia is one of the world’s foremost cycling spectacles, an iconic Grand Tour of huge significance to cycling fans and indeed all sports fans around the globe. Plans are already in motion to make the occasion a fabulous celebration worthy of Italian cycling events and the Maglia Rosa (the race leader’s pink jersey) itself. There will be a whole range of events and activities staged before and during the races. Northern Ireland now has several years’ experience of organizing world-class sporting and cultural events. By hosting the Giro d’Italia we will further strengthen the competitive position of our tourism industry and contribute to the economy in both the short and long term." There is a strong conection between Ireland and the Giro: Irishman Stephen Roche won the 1987 Giro d'Italia beoming the first Giro d'Italia victor from outside mainland Europe. Roche also won the Tour de France in 1987, only the fifth cyclist in history to win the Tour and the Giro in the same year. The "Grande Partenza" in Ireland will be the Giro‘s eleventh foreign start, after San Marino (1965), Montecarlo (1966), Belgium (1973), Vatican City (1974), Greece (1996), France (1998), Ntherlands (2002), Belgium (2006), Netherlands (2010) and Denmark (2012). The International Cycling Union (UCI) has today launched an online survey for cycling’s stakeholders that will run until 15 March. All stakeholders are invited to express their opinions and make proposals in order to contribute to "A Bright Future for Cycling". Responses are anonymous and confidential. The survey is managed by Deloitte who will report to the UCI Management Committee before mid-2013. In this way the contribution of cycling’s stakeholders will assist the UCI in deciding what changes and measures should be introduced to improve the organisation, functioning and image of cycling. The findings and recommendations will be published. The questionnaire (in English or French) takes around 20 minutes to complete. Click here for the on-line survey. We've been waiting, now it's finally coming. More photos here at flickr (including the 80th anniversary wheelset). Click on image to enlarge. Thanks for the tip C.
We wrote about it here last month. The announcement will take place tomorrow . Looking forward to the details. "Giro d'Italia organisers are expected to confirm on Thursday that the 2014 event will start in Ireland. Further details will be given at a joint launch in Belfast and Dublin which will outline plans to hold stages on both sides of the Irish border. BBC Sport Northern Ireland has learned that officials from the Giro will be attending Thursday's press launch. The Irish leg of the world famous cycling event is being tipped to take place from 2-4 May 2014. Tourism officials and government representatives from both sides of the border are expected to attend Thursday's respective launches at Titanic Belfast and Dublin's Civic Offices on Wood Quay. Estimates suggest that a figure of around £4m will be required to bring the event to Ireland but that the commercial return could be in the region of £10m. If the expected confirmation is made on Thursday, it will be the first time the Giro has come to Ireland and will mean that cycling's two Grand Tours will both make visits to Britain and Ireland next year, with the Tour de France starting in Yorkshire." The UCI's announcement, posted on the UCI website on Monday, stated that there would be 19 ProTour teams for this season rarther than 18 as normal. This followed the decision of the Court of Arbitration for Sport upholding Team Katusha's appeal of the UCI's decision not to issue the Russian team a WorldTour license. The timing of these events most affected the Giro d'Italia as it had already invited the 18 ProTour teams (not including Katusha) plus 4 wild cards as permitted. The Tour de France, coming two months later in the calendar and not having yet picked its wildcard teams, has decided to only invite 3 wildcards teams. The Giro has decided not to disinvite a team. Rightfully so, Aquarone is upset and had his this to say now, "I sent a message to Pat McQuaid, UCI President, and have not had a reply. We are surprised that no UCI manager has ever bothered to contact us, to find a solution, before the release of the announcment on Monday afternoon. It's unacceptable behavior. We always talk about how the sport has to grow, that we need to be more professional and organize everything in time. Instead, we find ourselves with one more team to race." Acquarone continued, "We did the inspections, measurements of space for coaches and team vehicles, booked hotels, etc., for every stage. For Ischia (Stage 2, TTT, 5 May) we defined the ferry requirements. Now we have to redo everything. What is the use of Mauro Vegni and his group to work all summer and then come these decisions? Beyond that, adding a 23rd team at the Giro has a cost of at least 150 000 €. I would expect the UCI to talk about it first rather than download this burden on our shoulders ". Ex-professionals and ex-racing licensed amateurs will be banned from gran fondo competition for a period after five years after retirement. The announcement comes from the Consulta Nazionale Ciclismoin in an effort to return gran fondo events back to their roots. Ex-professionals and ex-racing licensed amateurs may be registered as "cicloturisti" and can take part in such events as invited guests but may not be classified in the standings or participate in award ceremonies. More work remains to be done but this is a step in the right direction. Thanks to reader Gilles for sending it in. If anyone knows the name of the artist let me know so I can include it here.